US carmaker General Motors (GM) exited the India market in December last year, even the final lap, it raced ahead of some domestic and international peers in sales. Between April and December, 2017, GM sold 2,500 vehicles — more than what Force Motors, Mahindra Electric Mobility, Isuzu Motors managed to sell in the same period. If one excludes the new marquee launch Jeep from Fiat, then it too trail behind GM, with only 1,738 vehicles sold in April-December, 2017. In FY17, it sold 4,706 vehicles. 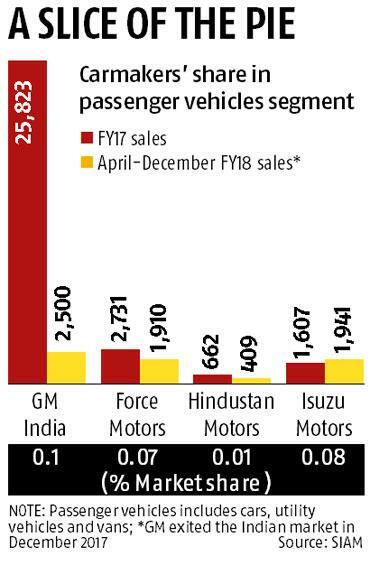 At the time of its exit, GM had a 0.1 per cent share of the passenger vehicles segment of the Indian car market. In the period under consideration, GM India sold 897 cars, more than what domestic major Mahindra and Mahindra sold (341). With its focus on electric vehicles, Mahindra Electric Mobility, maker of Reva, was also behind GM with 572 units sold in this period. In May last year, GM said it will stop selling cars in India. 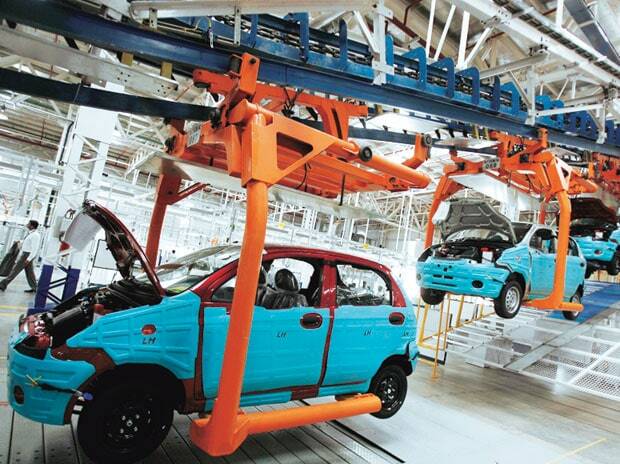 Its manufacturing base in Talegaon, Maharashtra, would focus on exports. It has 96 dealers and 120 sales outlets in India. GM did not send any cars to wholesalers in January this year. A source said dealers would have an inventory of 70-80 of its cars. GM ended FY17 with a market share of 0.8 per cent, having sold 25,823 units. In FY16, its market share was 1.1 per cent. India was a loss-making market for the company; in FY17, its losses stood at nearly Rs 80 billion. The Detroit-headquartered company has decided to focus on profits and not sales, and has been exiting loss-making readers. An industry insider said it was a smart move. “If volumes do not push margins, it is best to exit the market,” said a senior executive of a foreign carmaker in the country, adding that India has a huge potential for penetration by international automakers. GM’s India market share has been consistently better than many of its peers. For example, Skoda had a market share of 0.45 per cent in FY17. Its market share has been around the 0.4-0.5 per cent in the past three years. In the passenger cars segment, Fiat India, too, had a low market share of about 0.26 per cent in FY17, down from 0.41 per cent in FY16. Fiat banked on Jeep to take its sales up — it has worked for them. The company sold 13,139 Jeeps between April and December, 2017, boosting market share to 0.61 per cent. “We launched Jeep Compass on July 31 last year. In only six months we have achieved significant sales. There are nearly 15,000 Jeep Compass SUVs on Indian roads,” said Kevin Flynn, president and managing director, Fiat Chrysler Automobiles India. Japanese auto major Isuzu sold 1,941 units from April to December 2017, clocking a market share of 0.08 per cent in the passenger vehicles segment. Force Motors sold 1,910 units during the same period.